This year we will have a talk by the Rt. Hon. Michael Gove MP on the "Hot topics of the Day". This will be your chance to ask your local MP questions. After the tea break we will have our AGM, followed by the usual question and answer session with our local public officials. 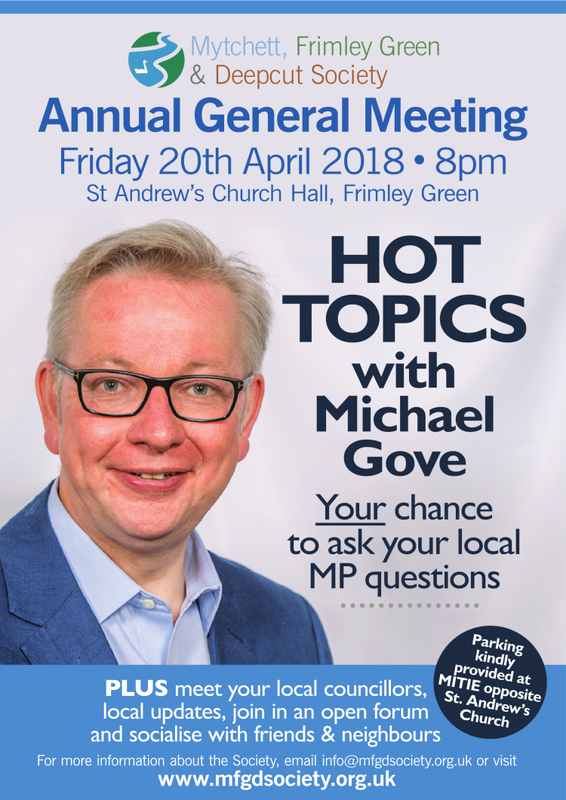 Parking for the AGM will be at the MITIE/south east water facility on the opposite side of Sturt road to St. Andrew's church and will be available from 7.00pm onwards. All people living in the area of Mytchett, Frimley Green and Deepcut are welcome but if your membership is not up to date or you do not wish to become a member, the price of admission is £3 per household. If you would like to save us collecting the membership subs at general meetings every year, please print out the standing order form from the MFG&D Website, fill it in and send it to your bank. You can also deliver your subs to one of the committee members whose address (bold) is given below in the Agenda under the Election of Committee section.